This is such a cool recipe! I have not made it in a few years, in fact I forgot about until I made a post and referenced a disease called Eosinophilic Esophagitis (EE). Sam used to have a playmate with EE and I got the opportunity to play around with different combinations of foods that never would have occurred to me in a million years! Several recipes would have made my stomach churn just by reading the ingredients and this is one of them! It was trick-or-treat night in 2005 and Sam and his little buddy we’re going out for the first “real” time to beg for goodies (I say “real” time because I took him out the first time when he was 18 days old, but I don’t think that counts! 🙂 ). We wanted to make a little party of it and pizza sounded like a great idea, never mind the fact that this little boy could not have tomatoes, dairy, beef, pork, mushrooms… you name it. If it was a “classic” pizza topping, it was pretty much off limits. Of course, I was too stubborn to just give up there! I made the following sauce and we made pizza with just the sauce and added chopped black olives, no cheese or anything else and it was really good! Think Bruschetta on a pizza crust. Nothing warms my heart more than to see little sets of eyes light up, especially when those eyes belong to little ones that battle such serious medical issues. Children such as these, who have been through more in one short lifetime than most adults ever go through in 40+ years, remind me of the pure and true joy in life. To make a child a pizza that consists of the following ingredients and to get a reaction greater than if you had bought them the latest “it” toy, is priceless. I don’t remember where I originally found this recipe but Living Without Magazine has it on their website here. One of the reasons I am making it again is not because I need to stay away from nightshades, but it is a really great way to “sneak” some very powerful vegetables in my family’s diet. While I love pumpkin, beets are another thing altogether! When I see a beet, especially those from a can, all I can think of is going to MCL Cafeteria (Ohio), as a kid with my parents and seeing all the “mature” patrons eating pickled beets with eggs. UFTA! Ever see these? How does one come to LIKE these?? Please forgive me if you love pickled beets, I am not picking on anyone. 🙂 It’s funny to me how an experience from childhood can still have such a powerful impact on your acceptance of a food! Or even how our food memories of childhood can make a later-in-life celiac diagnosis all the harder to accept (especially if you are “asymptomatic,” like I was, and are not motivated by pain to make the necessary dietary change). I have even tried roasting fresh beets and they still make me think of pickled beets… they (pickled beets) smell like sour dirt to me, plain and simple. Regular beets just smell like regular dirt though. 😀 Never one to give up, and trying to practice what I preach to my kids, “eat them, they are good for you!” I am now applying the same rule to myself. Before, when they would ask why I didn’t eat certain foods that I made them eat, I would just say, “I am done growing so I don’t need (“insert yucky vegetable here“). But now that Sam is 6, he is on to me. I think I actually use the Deceptively Delicious cookbook more for me than my kids! I need to hide certain flavors and smells in order to get them down. This is one of those types of recipes, if you can get past opening the can of beets (think clothespin on your nose). 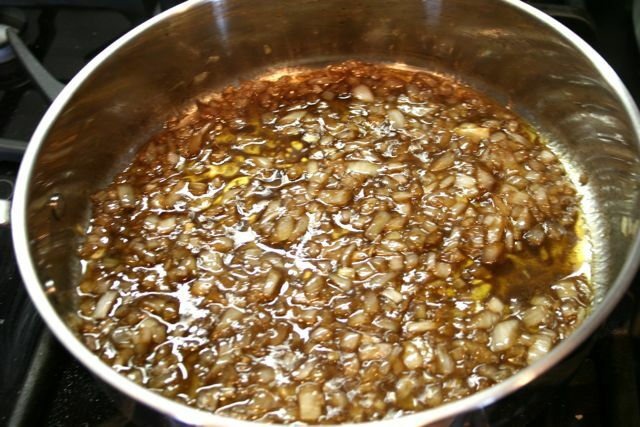 Sautee onion and garlic in oil until onion is translucent and slightly brown. Add lemon juice and vinegar. Simmer for 5 minutes. 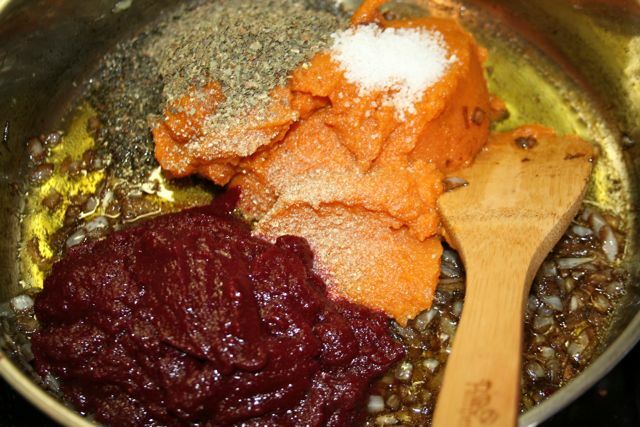 Add pureed beets, pumpkin puree, salt, pepper and basil to pan. Stir until combined. Whisk in the broth. Simmer over low heat for 5 minutes. 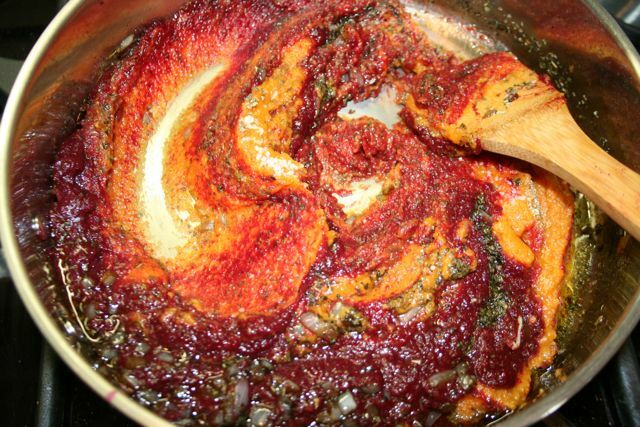 Do not over-cook; beets discolor with prolonged cooking. 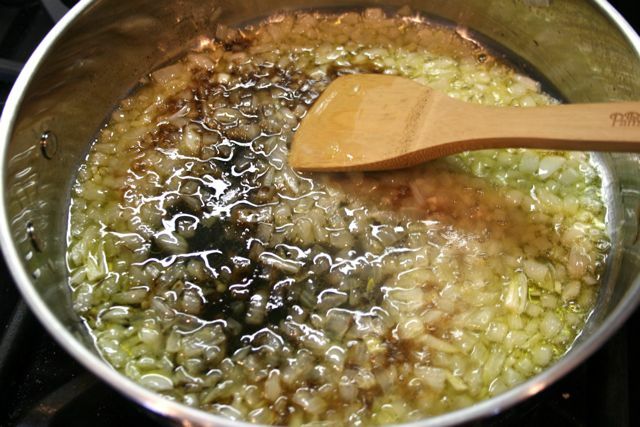 If sauce is too thick, add a little more broth to thin. Whisk in the moistened cornstarch (or arrowroot). Cook for 1 more minute. Taste and adjust seasoning. *TIP: If you prefer, you can use fresh beets. Roast them in the oven until soft and puree them in a food blender before adding to recipe. 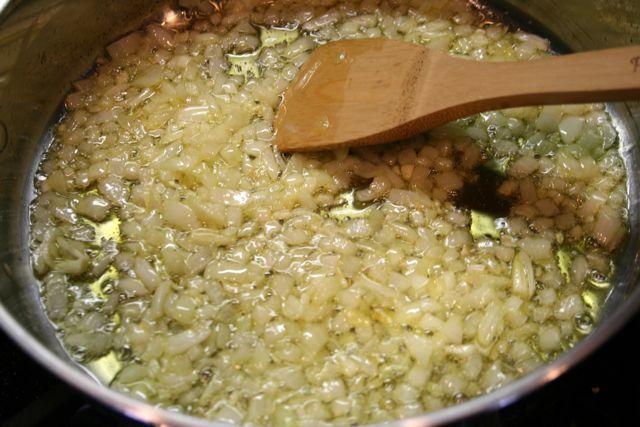 Sautee onion and garlic in olive oil. Add balsamic vinegar and lemon juice. Add the rest of the ingredients (except the beet juice slurry). I had to include this photo, the colors were so pretty! In case you are new to cooking: Never add a starch (cornstarch, tapioca starch, potato starch, arrowroot or sweet potato starch) directly to hot liquid! You will get unsightly little balls of starch: not good. 🙂 Make a slurry first with cool or room temperature liquid, then add to the hot ingredients. Now the starch is ready to be added to the hot mixture. Voila! This is a beautiful deep maroon color, with not a peep of beet flavor in it! YEA!!! This is really good, all my guys liked it too, and could not guess what was actually in it! WOO-HOO! I am going to use this sauce for a couple of things this weekend and will hopefully get the recipes up next week! I found some really interesting stuff on Nightshade allergies, so if you are interested, check out this. Nice! I had no idea you could make tomato-less marinara! Wow! This looks amazing! We may have to link to this from our blog too…it is right up our alley. We are a newer blog that has recipes that are all GF, free of the top 8 allergens, and vegan…check us out if you get a chance. We will add your great blog to our list and feel free to add us to yours! All the best and happy cooking! Thanks Megan! I will definitely check out your blog and add you to my blog roll. I am very interested in doing more vegan dishes and opening my children up to new tastes! Happy cooking to you too! I tried this recipe once jusst to see if I could tell the difference and honestly it was really really good. Thank you for posting it since I have wanted to try it again to work into the family diet.!! Wow, I love beets and can't wait to try this – mostly to freak my family out. Hubby says that beets taste too much like dirt to him too but I don't get the dirt taste at all. My kids won't eat them either so if I want any, I have to eat the whole can (not a problem). But I am definitely going to try this. LOL! I think the dirt thing is much like how some people love Brussels Sprouts and others hate them, there is just no in-between! Maybe some of us (the beet and Brussels sprouts haters) lack certain taste buds or something. 🙂 They are really good for you though, so I am on a never-ending journey to find a way that I can eat them without gagging! 🙂 I hope it works out for you! Okay this is going to be my first trial recipe with the bum knee. I know, why true the beet puree dish before the hostess cupcakes? Well because I am dying to find a tomato alternative for my tummy sensitive guys. I didn't look at the recipe prior to preparing for it and I bought fresh beets and fresh pumpkin. 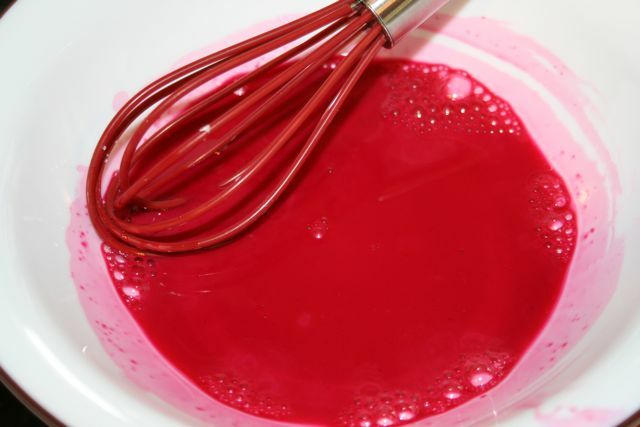 I know you said to just roast them and puree them, but what about the beet juice slurry~ Any recommendations? Just use water instead. 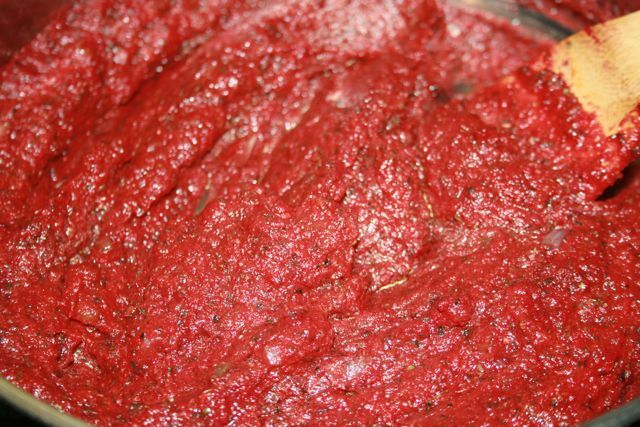 Use less water if you want more of a pizza sauce and more water for a marinara-style sauce. It really is good…you can't tell there is beet and pumpkin in it! Can't wait to hear what you all think of it! So I finally made this tonight and mixed it in with gluten free noodles. I told the children it was "purple spaghetti". Both kids gobbled it up and had seconds. Mine was cold by the time I got to it, so I didn't get the true flavor of it. I have left over sauce and as long as it doesn't bother any sensitive stomachs I may be using it on pizza like your original suggestion. Thanks for the recipe. You just blew my mind. A whole new world has opened up to me. THANK YOU for sharing this! This is great! Haven't tried it yet, but excited too. Great for those of us w/ Interstitial Cystitis, affected by so many foods, tomatoes included. As for myself I LOVE BEETS!!! Not pickled, no those do make you sick, whenever my husband eats them I gasp for a breath of fresh air. – but really, I grew up eating beets (canned) or out of my grandma's garden (so much better) and would always tell people they were my favorite vegetable. ummm! Off the top of my head, I don't think balsamic vinegar is on our list what would be a good replacement for it? I am thinking of trying to do this tomorrow as my son as a big spaghetti lunch with his his class on Mon. Is it just balsamic vinegar that your son can't have or is it all vinegar? Ok, just got done making the sauce…son loved it. And, wanted more…always a good sign. My turned out more orange than a deep purple. 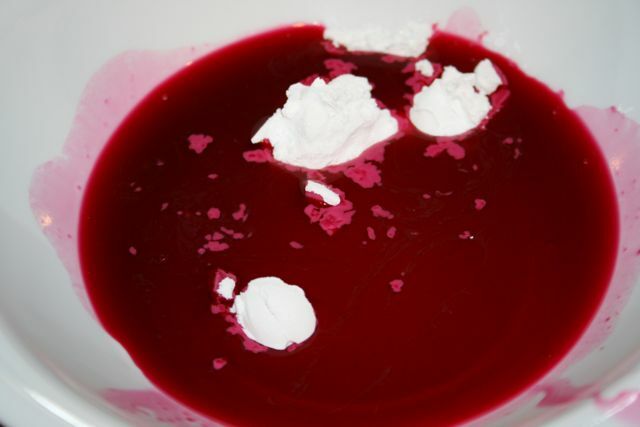 I didn't add all of the 1/4 cup liquid when pureeing the beets…could that have been the problem? It's a very thick sauce, but at least he can have pasta with the rest of his class. And, enjoy it more frequently now. Thankyou so much for posting this recipe, I have tried it before and plan to try again as I suffer from reflux. it tastes amazing, and once you have the ingredients fairly easy to make. great recipe! Heidi – I am so happy to have found this recipe. I recently cut tomatoes out of my diet and have been craving gluten-free pizza, but sometimes it's just not the same with no sauce. I will be making a HUGE batch of this yummy sauce this weekend. I can't wait! Thanks for sharing! You are awesome! This was so great for our pizza for a tomato-free guest. This has been such a huge blessing in my and my husband’s life. He can’t have nightshades and this opens up new doors for our food 🙂 We made it the other night and were flabbergasted. I took a bite of regular tomato sauce and could literally not tell a difference. I had about a table of rice vinegar in addition to the balsamic because I found that help bring out that acidic taste of tomatoes. I’m using it tonight in lasagna. Thank you so much! I just made this tonight and am absolutely flabergasted at how good it is!! It even got a big thumbs up from my 16 month old grandson. Thank you so much for sharing your talent!